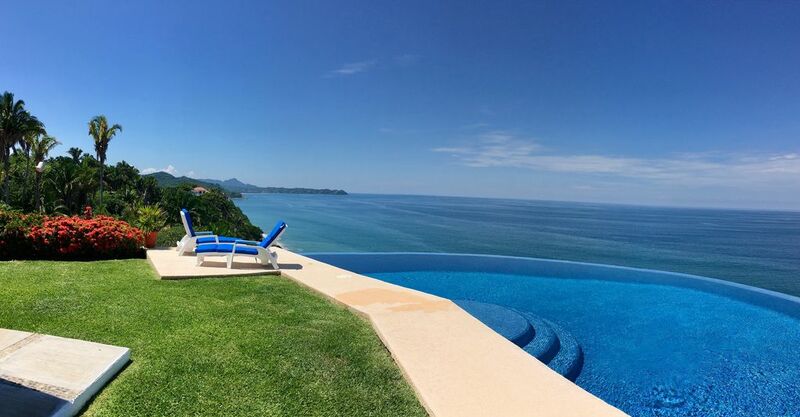 Casa Melissa is a unique private estate featuring breathtaking 180 degree views of the Pacific. Located on a point overlooking the Pacific, the views from Casa Melissa are uninterrupted and spectacular. Yet you can easily walk to San Pancho on the wide sandy beach. You can view the coastline from Punta Sayulita in the south to the outline of San Blas to the north. If you move your gaze to the east, you can view the beautiful tropical palm jungle. Casa Melissa is tropical Mexico as you dreamed it would be. During the day watch whales, dolphins and rays pass below as you enjoy a drink on the terrace or relax in the pool. In the evening the sunsets are breathtaking! Amenities of the villa include 4 beautifully appointed bedrooms, 3 bathrooms, a private lighted tennis court and a heated 'Infinity' swimming pool. All rooms in Casa Melissa have ocean views and fans. Doors and windows have screens so you can get the tropical air without any tropical bugs! Or you can use the air conditioning - available in all the bedrooms. There is also a whole house water purification system so water from the tap is safe. Additionally we have a bottled purified water dispenser with instant hot and cold water. The Casita, a 5th bedroom suite, features a queen bed, ceiling fan, air conditioner, full bathroom and a kitchenette. Its large ocean view terrace and overlooks the tennis court. The maximum number of guests at Casa Melissa is 10, but smaller groups only pay for the bedrooms they use. Casa Melissa is for those who want to get away from it all, and to relax in luxury surrounded by the natural beauty of the Mexican Riviera. Maid service is included Monday through Saturday. The staff will even grocery shop for you before you arrive - you just pay for the groceries! We want to make your stay at Casa Melissa a true vacation. Whales migrate along the coast between December and April. See them from the terrace or get close-up on a boat in the Bay of Banderas. Nature lovers can enjoy tropical birds flying by at eye level or go on a bird watching tour. See iguanas, geckos, tejones or tour the turtle nursery and help release baby turtles into the ocean. Ocean kayaking, snorkeling and hiking in the palm jungle or walking on the mile long sandy beach are a few of the best ways to enjoy this tropical paradise. The small town of San Pancho is unique. It has an active polo community and a polo field, a yoga center, a nine hole golf course and fabulous restaurants. There are many shops and a variety of restaurants within easy walking distance of Casa Melissa. Events during the year include a national surfing contest, annual music festival, and Art Festival in December. Or rent a car and explore the whole area. Besides fabulous views, Casa Melissa has a private lighted tennis court. The tennis court is a special Australian product that is used in the tropics, a synthetic grass surface topped with sand. It plays like clay but is ready for play 15 minutes after a rain shower (very important in the summer). The other great thing about the court is that it slows the game down - great if you are playing mixed doubles. What makes this tennis court unique is that it has an ocean view! Try not to get distracted by the pelicans flying by as you play the game. Casa Melissa has three bedrooms for the quoted price. The fourth bedroom in the main house and the nearby Casita bedroom suite are available for rent for an extra charge. The Casita is only rented as part of Casa Melissa. You would never share this beautiful estate with other renters. We are a family of 4. We have always spent part of the winter in Mexico. When we discovered San Pancho we knew this was the place where we wanted to build a house. We built the house to fit our family, so each of the kids had their own bedroom and could have a friend come down and vacation with them, plus we have an extra bedroom for the parents. We were lucky enough to visit San Pancho before it was 'discovered'. When we saw this property with its incredible views we knew we had to buy it. We see more of the coast/ocean then any other property in the area! It is magical. Arriving at Casa Melissa and looking at the view is immediately relaxing. My favorite thing is to swim in the pool mesmerized by the views in each direction. My husband and I disagreed on only one thing - which was the better view, the view to the south looking at Punta Sayulita or the view to the north looking at a series of small beaches. So most of the house has views to the south, but the master bedroom has views in both directions and has a balcony on the north side as well as opening to the terrace on the south side. In the mornings I sit in the dining room looking north and he sits at the opposite end of the table looking south. We worked it out. Besides the fabulous view, we had to have a tennis court. We built one made out of an Australian product that is sand and astro-turf. It plays like clay but is ready for play 15 minutes after the rain ends (very important in the summer). The other great thing about the court is that it slows the game down - great if you are playing mixed doubles or singles with your husband. Oh and the other great thing about the court is that it has an ocean view. Try not to get distracted by the pelicans flying over the ocean as you play the game. toilet, shower, Hand painted tile bathroom in the Casita. on a point above the Pacific ocean with unobstructed 180 degree ocean views from Punta Sayulita to south and several small beaches to the north. Fiber optic WIFI - bring your laptop or tablet! Couch, love seat and 2 chairs Flat screen TV with both Roku and AppleTV. You can have the kitchen stocked with your grocery requests upon arrival at no additional charge - you just pay for the groceries! Purified water dispenser with instant hot and cold water. Ipod docking stations in all bedrooms and livingroom. Some rooms have CD units. Three upstairs bedrooms open to this shared balcony facing south and west. Master bedroom has an additional private one facing north. (2) Casa Melissa has a patio facing north for early morning sun in the winter and shade in the summer afternoons. Opens off the dining room/kitchen. Has incredible ocean view. Casita bedroom suite has a large ocean view terrace that overlooks the tennis court. Private lighted tennis court with ocean view! Whole house water purification system, Screens on doors and windows, Ipod docking stations and bluetooth speakers. Private Lighted Tennis Court, heated infinity pool, Cook available for fee, for all meals, English-Speaking Maid, staff can shop for your requested groceries before you arrive so the kitchen will be stocked for you - including a pitcher of margaritas waiting for you in the freezer! Working with the home owner Melissa - Amazing! She answered every question so promptly and was so informative and kind. Casa Melissa - Amazing. So clean, comfortable, well appointed, lay out was perfect! Iris, Yeyo and their helpers - AMAZING! We were there for only 4 nights and it felt like they were family. Food was amazing, the house we kept so clean - they went above and beyond. They are all irreplaceable. We hope to come back next year and make Casa Melissa our home away from home. Casa Melissa is way over the top! I really enjoyed my stay and the house is just amazing! the views are breathtaking and the house is super equipped, you practically only have to bring your personal stuff, the house has everything, from speakers in every room to pool inflatables. I am definitely looking forward for my next stay at Casa Melissa!!!! Thanks for taking the time to write a review. I am so glad you have a great time. We look forward to hosting you again in the future. Book it...TODAY... you won't be sorry! Can't say enough good things about the property and staff at Casa Melissa. We spent 5 nights and will have memories to last a life time. The views are even more beautiful than the photos posted. Absolutely jaw dropping. Great for a family vacation or girl's trip. San Pancho is easy to walk to and the people are so gracious, warm, and welcoming. Would love to make this an annual trip. Thank you Melissa!!!! Thanks for your kind review. I am so glad everything worked out for you to have a fabulous birthday celebration trip. We hope you do get to return. Had a great time with my friends. The house and location are perfect. The staff lead by Iris is great, top service. Yeyo's food was phenomenal. 100% recommended. Hope to be back soon with the family. Thanks for taking the time to write a review. I'm glad you and your friends enjoyed your birthday stay at Casa Melissa. We would love to have you return in the future. This is the third time I have stayed at Casa Melissa--it's too good not to keep coming back to. It is truly spectacular. The house is beautiful and comfortable, perfectly maintained. But the location.....oh my. Watching purple and orange sunsets over the 180-degree ocean view from the infinity pool which feels as if it's dangling over the edge....truly. un. real. I can't say enough good things about this place. Without a doubt, the single most beautiful and wonderful place I have ever stayed in my life. Thank you for taking the time to review Casa Melissa. We have enjoyed having you stay at the property and we hope you can return in the future. Amazing property with an unparalleled view of the Pacific Coast! This home feels safe and relaxing while providing close access to the local social scene and beaches. Definitely would recommend to any group looking for an authentic Mexican getaway with cliffside luxurious perks. Thank you for taking the time to write a review of Casa Melissa. I'm glad you enjoyed your stay. We hope to have you return in the future. Polo Field with restaurant - matches weekly in season. Bird watching, surfing, snorkeling, stand up paddle, kayaking, swimming with dolphins, ancient petroglyphs, yoga center nearby. Also water park, and Cirque de Soleil show Joya at Vendanta just 20 minutes away. Massage at the house by arrangement, Watch whales and dolphins from terrace, or from the private heated infinity pool,. Private lighted tennis court onsite. Rates quoted are for a maximum of 6 guests using 3 bedrooms. The fourth bedroom in Casa Melissa is available for $30 nightly additional, max 8. The 5th bedroom Casita suite is available for an additional $50 nightly. Maximum guests staying on property is 10 including children. No pets allowed. Holiday surcharges: Christmas/New Years 20% additional. Thanksgiving and Easter 10% additional.